I have occasionally had the exquisite thrill of putting my finger on a little capsule of truth, and heard it give the faint squeak of mortality under my pressure. Letter to Stanley Hart White (Jan 1929), collected in The Letters of E.B. White (1976, 1989), 85. 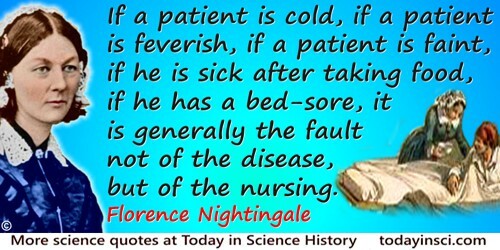 If a patient is cold, if a patient is feverish, if a patient is faint, if he is sick after taking food, if he has a bed-sore, it is generally the fault not of the disease, but of the nursing. In Notes on Nursing: What It Is and What It Is Not (1859), 6. Kirchhoff’s whole tendency, and its true counterpart, the form of his presentation, was different [from Maxwell’s “dramatic bulk”]. … He is characterized by the extreme precision of his hypotheses, minute execution, a quiet rather than epic development with utmost rigor, never concealing a difficulty, always dispelling the faintest obscurity. … he resembled Beethoven, the thinker in tones. — He who doubts that mathematical compositions can be beautiful, let him read his memoir on Absorption and Emission … or the chapter of his mechanics devoted to Hydrodynamics. In Ceremonial Speech (15 Nov 1887) celebrating the 301st anniversary of the Karl-Franzens-University Graz. Published as Gustav Robert Kirchhoff: Festrede zur Feier des 301. Gründungstages der Karl-Franzens-Universität zu Graz (1888), 30, as translated in Robert Édouard Moritz, Memorabilia Mathematica; Or, The Philomath’s Quotation-book (1914), 187. From the original German, “Kirchhoff … seine ganze Richtung war eine andere, und ebenso auch deren treues Abbild, die Form seiner Darstellung. … Ihn charakterisirt die schärfste Präcisirung der Hypothesen, feine Durchfeilung, ruhige mehr epische Fortentwicklung mit eiserner Consequenz ohne Verschweigung irgend einer Schwierigkeit, unter Aufhellung des leisesten Schattens. … er glich dem Denker in Tönen: Beethoven. – Wer in Zweifel zieht, dass mathematische Werke künstlerisch schön sein können, der lese seine Abhandlung über Absorption und Emission oder den der Hydrodynamik gewidmeten Abschnitt seiner Mechanik.” The memoir reference is Gesammelte Abhandlungen (1882), 571-598. Knowledge once gained casts a faint light beyond its own immediate boundaries. There is no discovery so limited as not to illuminate something beyond itself. In 'On the Methods and Tendencies of Physical Investigation', Scientific Addresses (1870), 7. The true mathematician is always a good deal of an artist, an architect, yes, of a poet. Beyond the real world, though perceptibly connected with it, mathematicians have intellectually created an ideal world, which they attempt to develop into the most perfect of all worlds, and which is being explored in every direction. None has the faintest conception of this world, except he who knows it. In Jahresbericht der Deutschen Mathematiker Vereinigung, 32, 381. As translated in Robert Édouard Moritz, Memorabilia Mathematica; Or, The Philomath’s Quotation-Book (1914), 184.